It’s been a little while since my last post – sorry, guys! After getting my new wheels at the beginning of August, I’ve been out riding every spare moment and revelling in my re-discovered freedom. Volty and I have clocked up over 1,000kms this past month, exploring coastal Victoria from the gorgeous wine valleys and beachside villages of the Mornington Peninsula to my favourite local ride, the scenic and wonderfully twisty Great Ocean Road. The novelty of owning a brand new bike really hasn’t worn off. I know it sounds silly, but my Suzuki TU250X is the first thing I’ve owned since my beloved 1973 VW Beetle (back in London over 10 years ago!) that I’m really rather proud of. And just as happened when I owned the Vee-Dub, everywhere I go on Volty I seem to make friends. On the road, the “biker’s nod” from other motorcyclists still gives me a little boost every time it happens. By getting back on a motorbike, I’ve re-gained my automatic membership to a very special secret society: It doesn’t matter what you ride, it just matters that you ride. I like that. Today, about 20 balaclava-ed Harley riders on bikes five times the size of mine nodded and tooted and thumbs-upped to me, one after the other – quite a sight, I can tell you! As they roared off down the coast in the opposite direction, I gave Volty a quick burst on the throttle for good measure, buoyed up all over again. By its very nature, motorcycling is a solitary activity – but it’s just about the most sociable thing I’ve ever done in my life. This sunny Sunday morning, I stopped off at the Sandown Racecourse to say hi to my old Ridetek riding instructors, Mel and Al. Two years ago, they saw me through my heady days as a wobbly scooter rider right through to passing my test on a 250cc motorbike. As we stood talking in the warm sunshine, admiring Volty’s sparkling chrome and gleaming bronze paintwork, I thanked the guys yet again for putting me on a road that now gives me so much happiness and enjoyment. Before I became a motorcycle rider, I didn’t know what I was missing – but now, I wouldn’t be without it for the world. This entry was posted in Adventure Travel, Motorcycling and tagged Australia, biker's nod, Biking, Great Ocean Road, Harley Davidson, Melbourne, Mornington Peninsula, motorbiking, motorcycling, Ridetek, Suzuki, TU250X, Victoria, Volty, VW Beetle on September 2, 2012 by Jeanie Davison. At the start of my hike – before the weather turned! Since announcing my new UNICEF adventure with Charley Boorman, lots of people have been asking me how they can combine their own travels with “giving something back”. Undertaking a big trip like India is a huge commitment in terms of fundraising and planning for the event itself. But you don’t need to embark on large-scale ventures to raise money for a good cause. Even a “mini adventure” can make a difference. Today, for instance, I’m just back from a day-long 40km hike along the Great Ocean Road. I love walking and on a whim, I decided to set myself a specific challenge with the little time I have this weekend, to raise much-needed funds for my UNICEF pot. The day before, I rallied round friends, colleagues and even my building manager (! ), asking them to sponsor my walk with any spare change. The hike itself turned into a bit of an epic. As I set off at sunrise, the coastal elements decided to throw everything at me – gale-force winds, hail, and a rockfall across the walking track which resulted in a messy scramble up a cliff (it wasn’t pretty – there weren’t any style points for that particular manoeuvre, I can tell you!). But I gritted my teeth and pressed on, spurred by the thought of the $250 I was raising for my cause. And hey, you don’t have to support a big charity. Why not think about a local charity or cause that raises money for animal welfare, health concerns, or maybe a community project of some sort? Whatever gets you passionate. Then find an adventure, great or small, get excited about it – and then get others excited about it! Not everyone will want to sponsor you, of course, but many will – some people love living vicariously through others’ adventures, so a bit of cash is a small price to pay, as they see it! I’m already planning my next mini fundraiser. I’m not really the bake sale type so I’m sure it will end up being another outdoorsy sort of challenge. I hope this post has inspired you to start thinking up your own ideas – good luck and here’s to adventures for good! This entry was posted in Adventure Travel and tagged adventure, adventures for good, charity, Great Ocean Road, hiking, London Bridge, making a difference, UNICEF, walking on May 13, 2012 by Jeanie Davison. The Great Ocean Road, about an hour out of Melbourne, is just perfect for motorcycling. Today, my Suzuki Marauder cruiser was positively humming as we snaked along the coastal road, ocean on one side, dense forest on the other, soaking up the sunshine, at one with the elements. I’ve done the route loads of times by car, but you really can’t beat doing it on a bike. The route winds through pretty villages like Lorne and Apollo Bay – great stop-offs to pull over, grab some hot coffee, and contemplate the gorgeous views out to sea. It really is biker’s heaven, with seemingly endless kilometres of road hugging the cliffs, then plunging down to the seashore, twisting and turning with satisfying curves that can only truly be appreciated on a motorcycle. I’m very lucky: the route is only about 90 minutes’ ride from where I live, so I get to do it every few weekends if I want to (and believe me, I do!). But if you’re a biker visiting Oz and looking for a beautiful ride, put The Great Ocean Road on your list: I promise, it won’t disappoint. Got a favourite motorcycling route? Share it by posting a comment below. 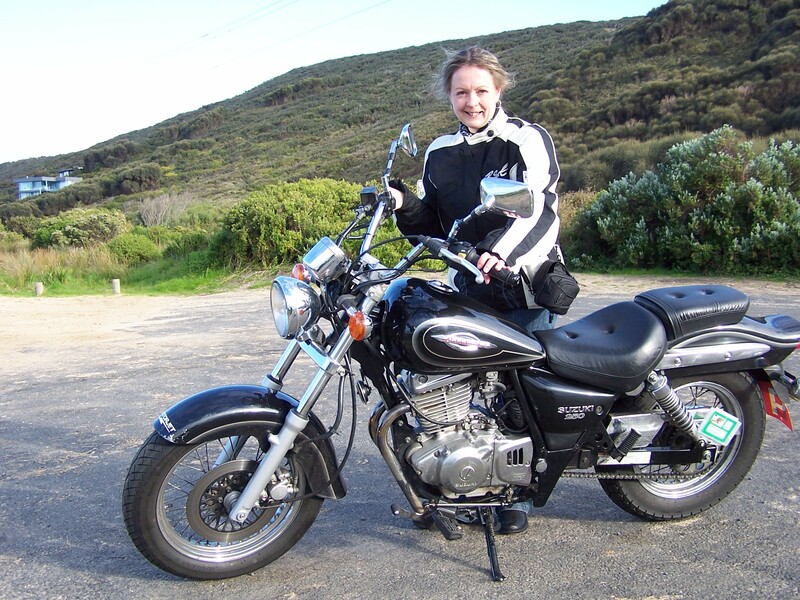 Or click on the Motorcycling tab above to read more about Jeanie’s motorcycling exploits. This entry was posted in Motorcycling and tagged biking Australia, Great Ocean Road, motorcycling on April 10, 2011 by Jeanie Davison.